November | 2011 | Thy Glory O' Nigeria..! General Ojukwu died in London in the early hours of today, 26th November 2011. He would forever be remembered for leading the BIAFRAN Army as the Republic of Biafra tried to secede from Nigeria. The war lasted from 1967 to 1970. There are loads of conflicting information about the Nigeria civil war. Depending on who tells the story the tales have been twisted and over twisted. Tribal undertones and sentiments and selfishness have denied the emerging generations the true facts behind the civil war. What is true is that genocide took place and many Igbo children were unprotected while the war lasted. One can only hopes that Ojukwu left behind, in the written form, the real and true story with his family. It will be interesting for historians to try a balance-up between the stories that already exist and the unpublished facts. Ojukwu, Goodnight and Rest In Peace. Nigeria’s EFCC, Toothless Bulldog Just Fooling Around..! EFCC is not about Ribadu who Obasanjo messed up with the third term wahala. It is not even about Waziri who like her boss Yar Adua wasted both space and time. And who is the new, old guy in the hermaphrodite commission. Let’s get it straight. We have a system that needs to be overhauled. This means that 99.9% of the people ruling Nigeria today need to be swept aside and sent to kirikiri or mental homes for their incurable lootocracies! All these stories about change of EFCC bosses every now and then are meant to create distractions and media entertainments. Imagine the parties and ceremonies that would have been thrown by those whose candidate is now the head. In a country where the police are efficient the likes of the people ruling Nigeria today will be cooling off, marking time. They won’t even be there to change the redundant and figure head anti-corruption bosses. We know that no country is free of corruption but when the thieves are known and walking free, even oppressing us, it is too shameful and over scandalous! When the Jonathans were still in Bayelsa Mrs. Jonathan was twice accused of stealing. The tragedy is that the two cases were inconclusive. What would have been the true stories if all the corruption cases in Nigeria are allowed to run conclusively? Who knows where the Bankole story will end. Many things trouble me, even the thoughts of David Mark and his presence in the looting business since the days of Babangida or before. Incomprehensible it is..! The euphoria of the change of baton will soon simmer and looting as usual will continue. As the years go by, the loot increases and the poverty level in Nigeria gets bigger and more devastating. This is the greatest pain ever in my heart, to see a people suffer in the midst of plenty and doing nothing about it. Nigerians are not too serious. They are not demanding. Else the 12 billion from the gulf war will surface tomorrow morning because Babangida who stole or took or kept them is still alive. If that new, old guy at EFCC wants me to take him seriously he should open the case and put Babangida on his toes, not just for the 12 billon dollars oil windfall but for all the looted funds that covers 8 wasteful years. When he is done with that, then he can proceed to the next big deal which is the open files that Obasanjo and Atiku made available to the press during the third term roforofo fight. Everyday in the newspapers we saw original copies of looted funds by Obasanjo and Atiku. It was a fight to finish but we let them off the hooks, just like that! So if EFCC has no work, they should at least open those files and bring these thieves to judgement. After that he can even arrest or press Ribadu so that he can release all the files about all the corrupt governors that he promised to prosecute when the immunity shield was over in 2007. What I am trying to say is that the EFCC is a toothless bulldog and has no real function or meaning compare to the scale of corruption, looting and impunity in Nigeria. The EFCC will never be able to deviate from his selective prosecution process. Somehow some people are mildly punished like Bode George and Tafa Balogun and Igbinedion. They get to keep most of the loots after plea bargaining or 6 months to 2 luxurious years behind bars. EFCC cannot deviate from selective prosecution because of the way Nigeria’s primitive politics is operated. The system is completely jagajaga. Sanity is an aberration in the Nigeria’s corridor of power. There is no genuine anticorruption war that the EFCC will start that will not consume all the past and present governors, past and present Ministers, past and present legislators-federal and state, past and present commissioners, past and present local government chairpersons. Even personal assistant and media spokespersons will be consumed, they are all corrupt o jare ! I state boldly and categorically that there is no genuine anti-corruption war that the EFCC will start that will not consume the past presidents and the serving president in the person of Goodluck Jonathan. Why are we fooling ourselves? In Nigeria corruption is a way of life. Nigeria’s needs to be straightened up and this must start from the top. If the head of the fish is rotten the entire body is bad, smelly and cannot be eaten. Nigerians should do all they can to replace their “heads”. The heads should be cut off or replace every time it goes bad so that the body is not infected or contaminated. Nigerians are the ones who need the power, not the EFCC. It is sad though because Nigerians don’t know how to utilize people power which is a function of numbers. Until Nigerians learn to use their numerical strengths to change the order of things, 90% of the population or more will seep deeply into poverty level. They may never recover! So the debate is not about EFCC but what the people can do to save the regions or the country itself and make it habitable for the unborn generations. Have a good life Mrs Farida Waziri. Enjoy all the money you stole or recovered loots that have no traces. It is not different from Abacha’s loot that Obasanjo and our imported finance Minister did abracadabra with. Enjoy all the gifts and all that. 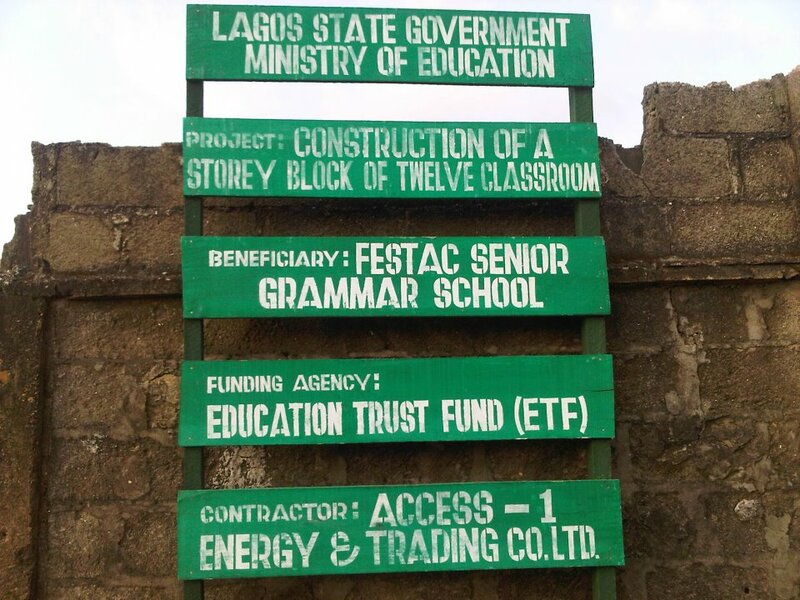 The Lagos State Government has finally sent one of its building contractors Access-1 Energy and Trading Company to start re-construction work at Festac Grammar School. Governor Fashola, Festac Grammar School Ti Baje o..! 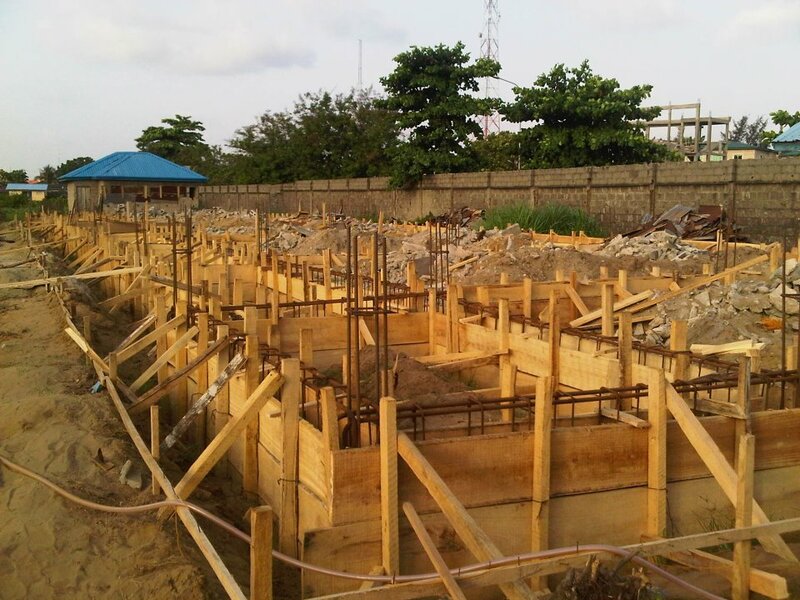 In April when this struggle started I had written that one of the greatest mysteries of Lagos State Ministry of Education is how a school that got the first prototype one storey-structure in the old Ojo Local Government was left to rot away totally as a predominantly poultry school. It seems that the government of Governor Fashola, in a reaction to the series of stories about the embarrassing situations at FGS, is set to repair, renovate and re-construct FGS. I also made a promise that was hard to keep. But I did my best. The ultimate goal was to write about Festac Grammar School once a month because as I stated then: the problems with Festac Grammar School became for me a personal struggle. It is still a cause. Now that hope has come, I feel obliged to write this story about the presence of Governor Fashola in Festac Grammar School through Acces-1 Energy Trading Company. I have not received the details of the contract; therefore I am not in a position to describe the extent of the work that will be done. However I do know the old storey building that was built in 1985 has now been given some re-touching in terms of structural maintenance. One of the dilapidated poultry block of classrooms has been pulled down completely to pave way for a new storey building of 12 classrooms. These developments are in the positive directions. They are in line with one of the long-term objectives of the Alumni Association to ensure that the school poultry structures built by Lateef Jakande are overhauled and replaced by modern storey buildings. This objective should never be different from the functions of the Lagos State Ministry of Education. How schools are allowed to rotten remain inexplicable and if we tie it to the systemic corruption in the Nigeria system then it is an indication of what I feared most: that the future of the unborn generations remain stolen. Whichever way, it gladdens the heart and it brings a sense of fulfillment to witness the re-construction work at FGS. Without any doubt I am convinced that it was a rapid response to our calls that have been made on the NVS and some of our blogs. The Lagos State Government has shown that we do not need to know anyone in the corridors at Alausa in Ikeja before our agitations can be attended to. What the LASG must also ensure is that it carries out its functions without allowing us to carry the burdens to the web space all the time. Our agitations and concerns are genuine and noble. It is clear that we want education to be promoted. A sane environment is necessary to produce sane minds. A sane environment is necessary to nurture the future generations. On our part as members of the Alumni Group we have made progresses. We have donated some equipment to the school and we have helped them to settle electricity bills. We have more plans. In terms of our organization we are now duly registered and our activities are governed by a written constitution. We are in the process of electing our executive members to take over from the caretaker committee and more than ever before the future of the Alumni Group look secured. This year, less than 5 months after we re-converged as Alumni Group from our different niches we have organized career day/ workshop at Festac Grammar School and we have awarded prizes to outstanding students. We have made ourselves more visible in Festac Town and we have provided ourselves with the platform that will motivate the students attending Festac Grammar School. They are now in contact with us. We have a wonderful opportunity to be their role models and mentors. For us this year is a success story in the history of our Alumni Group. It is not yet Eureka! It must be pointed out that governments in Nigeria are fond of abandoning projects and looting the funds earmarked for such projects, even after the shameful 10% kickbacks. We hope that the re-construction work at Festac Grammar School will be neither a half-baked project nor an abandoned one. Our hope is that this rejuvenation that will inspire and motivate the students and staffs of FGS. The Alumni Group, as promised in a previous essay, will work closely with the leadership of the school to emphasize the importance of maintenance culture. On the long run too, we will have to find the appropriate communication channel to ease information flow between the Lagos State Ministry of Education and our Alumni Group. That will help us to know first-hand about the plans that are made for schools in Lagos and how often the structures will be checked for comfort and safety. The academic aspect can also not be over emphasized. Quality control measures should be re-introduced while all hands must be on deck to rescue the “dying culture” of attending public schools. No matter what happens, FGS will remain in our hearts and we will never relent until the image of the school both in terms of structure and academic excellence are revitalized fully. We are committed. In 2009 Reuben Abati recommended that it will soon be time to start stoning the economists in the corridor of power in Abuja. In 2011 I strongly recommend that everyone in the corridor of power and all those who are called stakeholders who have supported the removal of the subsidy on oil and oil products should be stoned. Goodluck Jonathan has pinned the reactions of Nigerians to the proposed removal of subsidy on those who want to throw him out of office. I say that he fired the first rounds of shots on his legs. If this will mark the beginning of the end for his insensitive regime, let the occupation starts. I want to ask the same questions that Reuben Abati asked in 2009: How? Where is this subsidy that government talks about? How was it disbursed? Reuben Abati wrote in that headline that Nigerians will soon be trekking. Sadly enough Nigerians have actually been trekking before 2009. I remembered trekking from festac town to CMUL during the 2001/2002 fuel scarcity. I had obligations that couldn’t wait. In 2011 Nigerians are not only willing to trek, they appear ready to march down the Jonathan government that has come to be characterized by weakness in all its ramifications. From one generation to another, the Nigerian government presents a constant image of a permanent aggregation of dubious elements. In my personal opinion I have concluded that no amount of additional suggestions or written essays can solve Nigeria’s problems. Are there problems facing Nigerians that the solutions have not been proffered here in the Nigerian Village Square or elsewhere where Nigerians display their intellectual capabilities? Do we have problems in Nigeria that we have no discussed about openly? What has happened to their implementations? I believe so much in the solution proffered by Reuben Abati. Even so because when it is carried out it will consume people like him. I like such solutions that will not spare the hypocrites, the pretenders, the sycophant and the famously corrupt people in government, many of whom have recently been rewarded by meaningless national awards over several years. I can’t imagine how people receive national awards in one of the most corrupt countries in the world. How does it feel to receive national awards in a country with one of the highest child and maternal mortalities in Africa? How does it feel to receive awards in a country where electricity is almost absent? How does it feel to receive national awards in a country where public education is almost grounded? If Nigerians obey Abati’s call by simply rising up and stoning the people in the corridor of power, I am convinced that the revolution we long sought will start. It might be ultimate the clean-up we have waited from since 1960. It is sad how things have turned out for the ordinary Nigerians. On a poverty wage of USD 113/ month, a Nigerian is expected to pay his rent, bills, and sundries. There is no greater miracle on planet earth than a Nigerian living on N18 000 per month. In a country where more than 20% of the population is unemployed, I have found it hard to find a greater tragedy against the back drop of the immense natural resources and potential human resources. If there is any country in Africa where the government should be giving relief packages to her citizens after 50 years of misrule and leadership failure, that country is Nigeria. In a twist of test of resiliency the ordinary masses will be insulted further. For failing the build or maintain functional refineries, for failing to fight or curb systemic corruption, for failing to deliver on the so-called dividends of democracy, the insensitive Nigerian government now headed by Goodluck Jonathan will make Nigerians suffer even more. Rather than relief package the economic team of Goodluck Jonathan, his executive council and the so-called stakeholders will deliver loads of additional burden onto Nigeria. The arguments are hinged on the famous textbook concepts rather than the realities on the ground. There are no arguments that the Jonathan government has put forward that is different from what Obasanjo and late Yar Adua proposed. In all the previous partial or total removal of subsidies that have been used to increase the pump price of petroleum products, there has never been a corresponding increase in the quality of lives of the Nigerian people. There is absolutely no reason to believe or trust the Jonathan government. It represents the PDP government that has held sway since 1999. The PDP is the largest aggregation of corrupt people in Africa. Under the PDP the quality of life has declined sharply at the same time that the cost of it has continued to increase unhindered. This, as Jonathan feared in his recent utterances that the opposition wants to bring down his government, must be the last test of resiliency for Nigerians. Any attempt to increase the burden of Nigerians should be met with the highest possible resistance. The opposition that I see is the over 90m Nigerians living below the poverty level. The argument that the state governors are in support of the removal of fuel subsidy does not hold water. Which governors? We know they want more money from the 52% that the federal government has been looting for several years because they are all the same birds. Why should what the governor wants be a benchmark for what the people want? Why do the extremely rich but corrupt people in the corridor of power think that they know what is good for the suffering masses? When will the voices of the people start to matter democratically, if truly we are under a democracy? I think it is sad and disappointing that Jonathan think that only the people in the middle class who have 4-5 jeeps will be affected by the subsidy removal. A lot of middle class Nigerians are even still struggling to maintain their statuses and to continue to pursue a happy life. The dynamics of the Nigerian economy certainly reveals that the masses are the end-receivers of failed policies. When the subsidy is removed there is no doubt that the cost of transportation that is already exorbitant will increase further and the prices of dietary and other consumable products will follow the same curve. We cannot live in denial and allow those who are shielded from the reality of everyday existence since they got to the corrupt corridor of power speak for us any longer. Reuben Abati and the other advisers cannot speak for the masses. Nigeria has not improved since this administration started wasting our time. Policies or parameters that neither put food on the table nor increase the quality/standard of living are abstract and worthless. The practical situation in Nigeria today is worse and even more deplorable compared to 2004. Someone, an ordinary Nigerian who knows where the shoes hurt, wrote today that Nigerians should be ready to turn sand to food. In all sincerity he was not joking and he didn’t think we should laugh about his comment. People are suffering. Nigerians need relief packages and they should be brought forward now. If this virtual subsidy on oil products is removed and Nigerians remain resilient, it means our collective “suffering and smiling” will continue. It also means that People Deceiving People Party and the team of political and economic looters who are blind to the reality of a daily Nigerian life have succeeded again. Our glory is not yet come and that is so sad and disheartening. I doubt that even president Jonathan is feeling safe in Abuja. Let us imagine that he is attending a ceremony at Sheraton in Abuja say in February 2012 and suddenly the entire building blows up. Let us imagine that no one comes out alive from the ceremony. Is it worth dying for what you don’t believe in? I don’t think so. I think it is senselessness and stupidity to waste one’s life and that of others. Nigerian politicians and other stakeholders who are beneficiaries of the senseless situation in Nigeria are hiding away from the truth. But with the security situation out of control and Nigeria gradually and slowly nearing that chaos that would ultimately tear it apart, isn’t it more reasonable to give Northern Nigeria to the Northerners? Isn’t it time for us to go back to our regions and leave Abuja alone? No, they always argue because they are beneficiaries of a corrupt system where stupid people and morons hold sway. They think the rest of us are unfortunate and that we are their slaves. Boko Haram has come to stay not only because of the weakness of the Jonathan administration but also as a result of 51 years of extremely bad governments. Corruption and outright madness prevails in the Nigerian political experiments. External terrorist forces are now established in Nigeria and we must find a way to ease them out. With Nigeria in mind and the wars around the world in the name of freedom, democracy has come to represent the hallmark of human failures. Liberia is nearing another round of chaos in the name of bad elections and foreign interferences. President Jonathan of Nigeria must know that a burning house has no master or lord. Nigeria is burning and the rate of combustion is remarkable. How long before Abuja goes up in flames? All the people living in Abuja and Northern Nigeria are now no longer safe. They are constantly exposed to danger and threats that can consume them and their loved ones at any time. Is this the life we chose? The longer Nigerians wait before they return to regional government, the more catastrophic the disintegration will be when it finally arrives-with full force. An idea whose time has come, or an idea whose time for return is near, cannot be stopped. It is time to return power to the regions. President Jonathan and his army of corrupt men and women at the National Assembly can still try hard enough to redeem what is left of their almost irredeemable corrupt images. They can stop stealing and face the reality of the lives we live for once. They can call for referendum on the way forward or they can call for sovereign national conference. In that case Boko Haram will have no excuse. They will send representatives who will speak for them on how they want to lead their lives in North-East Nigeria. At that time, the failure of Boko Haram to make representation can then be met with a full scale war and possible outcome can be the wiping out of anything Boko Haram. Obviously we had regions before the stupid creation of states by the military. It is easy for me to argue that people should belong to the regions they were in before the creation of states. In the case of arguments and rife, long negotiations should set in and in the end agreeable compromises can be made, no matter how long it will take. Not doing anything about the current situation in Nigeria is even worse. It is as worse as anybody or anyone including the selfish politicians and rest of us can be consumed by the Boko Haram phenomenon. Nigeria is one of the biggest crimes against humanity that I know. Nigerians should wake up and for once have a say in how they want to lead their lives in their various regions. If the wave of Boko Haram spread to all parts of Nigeria, it may be too late to discuss. At that time, we will be fighting fresh rounds of civil war. The devastations will be worse than the Biafra war. I don’t think we can afford that. Even Africa and the world cannot afford a full blown war in Nigeria. So, let’s talk and act immediately now and stop pretending that all is well.